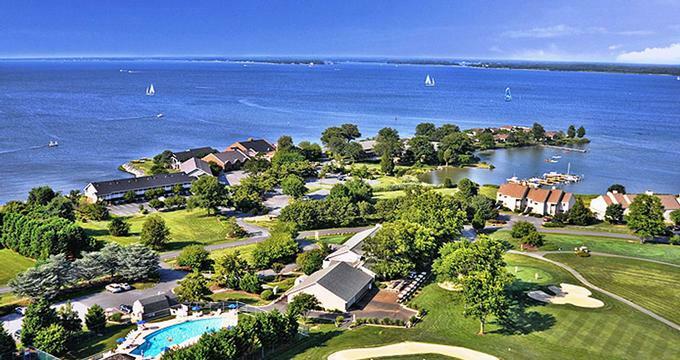 Resting on the shores of Chesapeake Bay, Harbourtowne Resort in St. Michaels is a deluxe resort and conference center on Maryland’s famous Eastern Shore. The charming 153-acre retreat features luxurious accommodations in the form of guest rooms and suites with modern amenities and private porches overlooking the water, an award-winning restaurant that serves some of the region’s best seafood and a range of function facilities for a variety of events. The one-time hunting lodge turned stylish getaway boasts a relaxed ambiance and is ideally placed for both exploring the area or simply staying put and enjoying the excellent facilities and beautiful surroundings of the resort. A delicious Eastern Shore breakfast buffet is served every morning while two restaurants and a casual lounge serve sumptuous meals and drinks throughout the day. A variety of facilities is available for every taste, from volleyball, badminton or horseshoes to hiking, mountain biking or sailing. 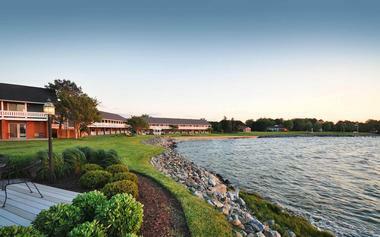 Easily accessible from the majors cities of Washington, D.C., Baltimore, Philadelphia, Delaware and New Jersey, this waterfront resort offers the perfect escape for holidaymakers, corporate businesses and wedding parties alike. Harbourtowne Resort features 111 comfortable guest rooms and suites, each offering spectacular views over the waters of the Chesapeake Bay and the Miles River from private porches. All guest rooms and suites feature two double beds or one king-size bed with pillow-top mattresses, soft pillows, and crisp linens, and private en-suite bathrooms have soaking bathtubs, showers, and gourmet bath products. Additional amenities include 32" flat screen digital televisions with cable channels, irons, ironing boards and hair dryers, Keurig Coffee makers and gourmet coffees and teas, and complimentary high-speed wireless Internet. Harbour View Double Rooms feature two double beds with pillow-top mattresses, soft pillows, and crisp linens, and private en-suite bathrooms with soaking bathtubs, showers, and gourmet bath products. Sunny sitting areas feature modern amenities including 32" flat screen digital televisions with cable channels, irons, ironing boards and hair dryers, Keurig Coffee makers and gourmet coffees and teas, and complimentary high-speed wireless Internet. Private balconies or porches offer stunning views of the harbor. 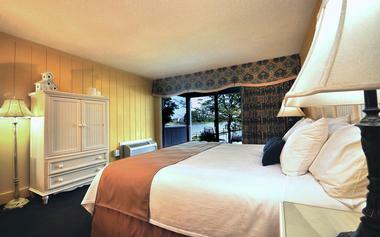 Bay View Double Rooms feature two double beds with pillow-top mattresses, soft pillows, and crisp linens, and private en-suite bathrooms with soaking bathtubs, showers, and gourmet bath products. Sunny sitting areas feature modern amenities including 32" flat screen digital televisions with cable channels, irons, ironing boards and hair dryers, Keurig Coffee makers and gourmet coffees and teas, and complimentary high-speed wireless Internet. Private balconies or porches offer stunning views of Chesapeake Bay. Bay View Suites are spacious and bright with separate sitting rooms that have wood-burning fireplaces and private front patios or balconies with gorgeous views of Chesapeake Bay. Modern amenities abound, including 32" flat screen digital televisions with cable channels, irons, ironing boards and hair dryers, Keurig Coffee makers and gourmet coffees and teas, and complimentary high-speed wireless Internet. Bedrooms offer king-size beds with pillow-top mattresses, soft pillows, and crisp linens, and private en-suite bathrooms have soaking bathtubs, showers, and gourmet bath products. Situated along the banks of Chesapeake Bay, Bay View King Suites are private and secluded with private front patios or balconies boasting breathtaking views. Spacious sitting areas have wood burning stoves and modern amenities, including 32" flat screen digital televisions with cable channels, irons, ironing boards and hair dryers, Keurig Coffee makers, and gourmet coffees and teas, and complimentary high-speed wireless Internet. Bedrooms offer king-size beds with pillow-top mattresses, soft pillows, and crisp linens, and private en-suite bathrooms have soaking bathtubs, showers, and gourmet bath products. Guests can savor the very best of St. Michaels tastes and flavors in the outstanding seasonal cuisine served at the two onsite restaurants at the Harbourtowne Resort. Days begin with a hearty gourmet breakfast buffet served in the Bayview Restaurant, which features cold starters and selection of breakfast cereals, yogurts, baked pastries and bread, seasonal fresh fruit, hot breakfast entrées, and fresh-brewed coffee and teas. The Bayview Restaurant also serves a dinner menu of locally sourced regional cuisine and freshly caught and prepared seafood. Specials include Seafood Thursdays and a Prime Rib Buffet special, always popular with families! The cuisine is accompanied by an extensive drinks list, which features local and craft beer, fine wines and a range of handcrafted cocktails and spirits. The Duck Blind Bar is a seasonal bar that offers a full service bar menu of cocktails, spirits, wines, and beer, as well as a grill menu of pub favorites. The bar enjoys a casual, relaxed atmosphere and has a beautiful outdoor deck overlooking the Chesapeake Bay, which is perfect for sundowners or cocktails. 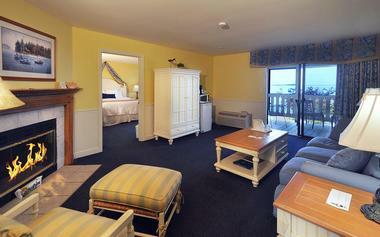 Harbourtowne Resort is a premier destination for romantic weddings on the shores of the Chesapeake Bay. The exquisite property is the perfect setting for a spectacular sunset ceremony or late afternoon reception on the Bayside Deck and offers a range of indoor and outdoor venues, as well as special wedding services and packages for every style and type of gathering. Harbourtowne Resort can accommodate up to 150 wedding guests in settings ranging from formal to informal. Located at the water’s edge overlooking the Chesapeake Bay, Bayside Point Deck is a stunning setting for a waterside or lawn-style wedding. After exchanging vows, the wedding party can gather on the nearby Bayside Deck for drinks. 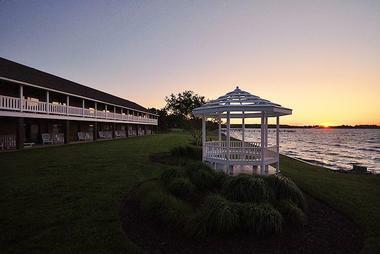 The Bayside Deck offers a spectacular backdrop for outdoor receptions and banquet-style dinners for up to 150 guests. The Deck can be used during good weather, with tables and chairs set out on the lawn, surrounding a dance floor under the stars. Tents can be arranged in the case of bad weather. The Prospect Bay Ballroom accommodates up to 150 guests around a dance floor and offers an elegant and spacious venue for all styles of event, from standing cocktails to seated banquets. The Bayview Restaurant seats up to 200 guests and opens out onto the Bayside Deck where guests can dance and enjoy drinks under the stars. Harbourtowne Resort is also an ideal venue for corporate retreats, business meetings, and conferences, with over 7,000 square feet of flexible meeting space accommodating from ten to 160 guests. Venues range from boardrooms and meeting rooms to banquet rooms with waterfront views and beautiful outdoor spaces overlooking the Chesapeake Bay, all of which are equipped with highest-quality audio-visual technology. Measuring more than 2,100 square feet, the Prospect Bay Ballroom can accommodate up to 200 guests theater-style or 160 banquet-style and can be divided up into smaller functions and events. The Shaw Bay Ballroom covers approximately 2,150 square feet and can accommodate up to 140 guests theater-style or 100 for banquets while the Water's Edge is a modern 660-square-foot private meeting and banquet space that is ideally situated near to the Bayview Restaurant for break-out sessions. Located on the second floor of the resort hotel, the Riverview Room accommodates up to 40 guests and can be used in conjunction with the adjacent Chesapeake Lounge, which offers spectacular views over the Bay. Resort amenities at Harbourtowne include two family-friendly restaurants, a casual bar and grill, and an array of activities, including outdoor lawn games such as horseshoes and badminton, kayaking, stand up paddle boarding, volleyball and sailing (nearby). Bikes can be rented for exploring the area, and the resort offers guests complimentary parking and free high-speed wireless Internet. Nicknamed the “the town that fooled the British” - after being forewarned of an impending British attack during the War of 1812, the town residents raised lanterns into the trees above the town to create a diversion, and the town was spared - St. Michaels had a booming shipbuilding and seafood processing industry in the 1800s and early 1900s. Located just minutes from Harbourtowne Resort, St. Michaels oozes the vibrancy and charm of a 19th-century seaport, complete with winding cobblestone and brick-lined walkways, centuries-old Victorian homes and beautiful views from every corner. One of the city’s main attractions is the Chesapeake Bay Maritime Museum, a vast 16-acre complex that features a variety of exhibits that explore and showcase the history and traditions of the Chesapeake Bay area. Visitors to the museum can enjoy a variety of events and festivals throughout the year, including horse-drawn carriage rides, bay cruises in a sail-powered skipjack, rides on the Oxford-Bellevue Ferry, and Big Band concerts under the stars. Lighthouse offers visitors the chance to experience a day in the life of a lighthouse keeper and Tilghman Island is a historic island in the heart of Chesapeake Bay. The St. Michaels Museum captures the legend and lore of old St. Michaels with a range of excellent exhibits and displays.